One of the new technologies in iOS 9 is "predictive touch," an addition that may presage the launch of an Apple-made stylus in tandem with an anticipated jumbo-sized 12.9-inch iPad. 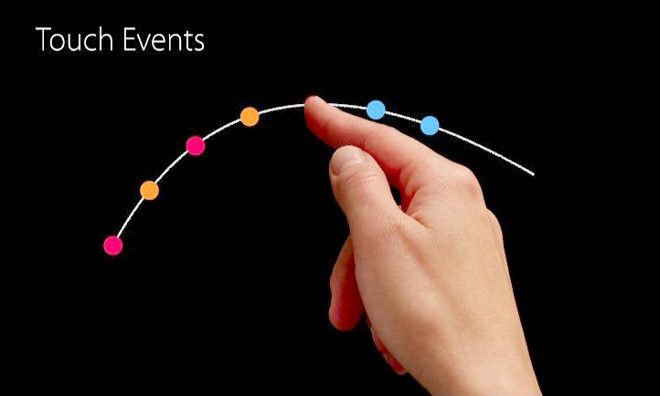 The new predictive touch feature was announced during this week's Worldwide Developers Conference as part of a "What's New in Cocoa Touch" session. In a video of the session, senior iOS engineering manager Jason Beaver explains that iOS 9 not only tries to reduce touch response times, but also uses curves, velocity, and acceleration to predict at where a touch input might be headed. Cocoa Touch is the core interface framework in iOS. Predictive touch is typically considered an essential feature for serious stylus use, since it makes drawing faster and more accurate, Cult of Mac reported. In May, AppleInsider learned that one of the main features of the long-rumored 12.9-inch iPad —which has colloquially become known as an "iPad Pro" —will be support for an Apple-made Bluetooth stylus. It's not clear if the stylus will be bundled with the new iPad or sold separately, but bundling it could help set the larger model apart from the rest of the iPad lineup. iOS 9 is due to launch in the fall, which may suggest that the so-called "iPad Pro" will be announced in the same timeframe. Last year new iPhones were announced in September, while new iPads debuted in October. Other anticipated features of the new iPad include Force Touch, a USB-C port, and some sort of NFC functionality. Rather than being used for authorizing Apple Pay transactions, as on iPhones and the Apple Watch, NFC may be used to pair a stylus automatically, or to allow it to be an Apple Pay receiving terminal at retail.